Figure 1.5: HR diagram of T Tauri stars. Many emission lines are found in the spectra of T Tauri stars. WTTS (Weak Emission T Tauri Stars) and CTTS (Classical T Tauri Stars) are classified by the equivalent widths of emission lines. That is, the objects with an EW of H emission is usually termed a WTTS. Taken from Fig.1.2 of Hartmann (1998). T Tauri stars are observationally late-type stars with strong emission lines and irregular light variations associated with dark or bright nebulosities. T Tauri stars are thought to be low-mass pre-main-sequence stars, which are younger than the main-sequence stars. Since these stars are connecting between protostars and main-sequence stars, they attract attention today. More massive counterparts are called Herbig Ae-Be stars. They are doing the Kelvin-Helmholtz contraction in which the own gravitational energies released as it contracts gradually and this is the energy source of the luminosity. Many emission lines are found in the spectra of T Tauri stars. WTTS (Weak emission T Tauri Stars or Weak line T Tauri Stars) and CTTS (Classical T Tauri Stars) are classified by their equivalent widths (EWs) of emission lines. That is, the objects with an EW of H emission is usually termed a WTTS. 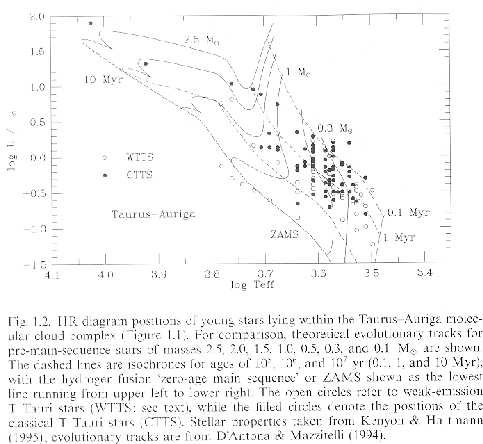 Figure 1.5 is the HR diagram ( ) of T Tauri stars in Taurus-Auriga region (Kenyon & Hartman 1995). WTTSs distribute near the main-sequence and CTTSs are found even far from the main-sequence. A number of theoretical evolutional tracks for pre-main-sequence stars with are shown in a solid line, while the isochorones for ages of , , and are plotted in a dashed line. Vertical evolutional paths are the Hayashi convective track. Since D= H has a much lower critical temperature (and density) for a fusion nuclear reaction to make He than H, Deuterium begins to burn before reaching the zero-age-main sequence. This occurs near the isochrone for the age of and some activities related to the ignition of Deuterium seem to make the central star visible (Stahler 1983).